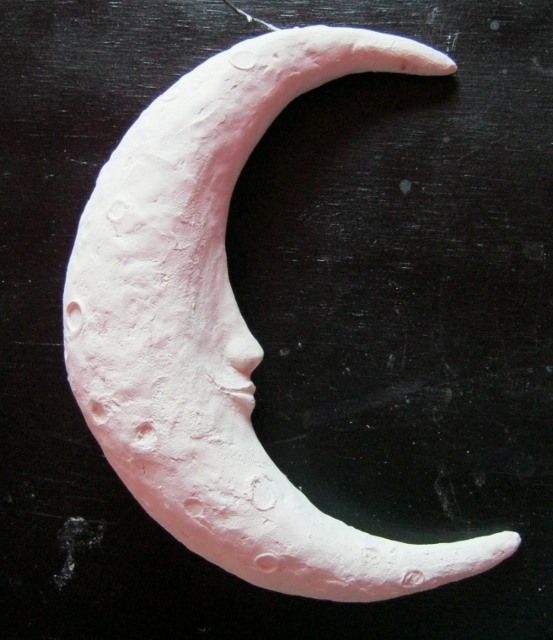 This tutorial shows how I made a heavenly crescent moon art sculpture for a client using paper clay, simple craft supplies and common household items. 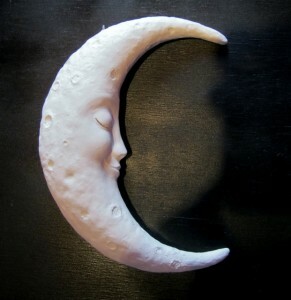 The techniques I share can be used to create sculptures in different shapes and sizes. 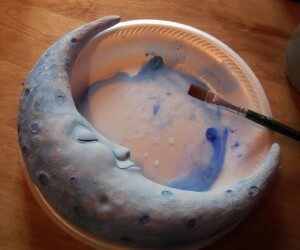 You’ll see step by step how the project progressed from the initial sketch to creating a foundation, building the moon sculpture in layers and then painting it. 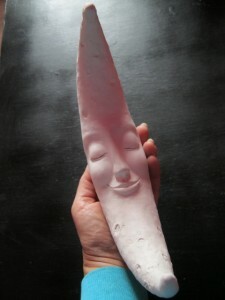 Whenever I’m making a sculpture, I often start with a sketch. Because this was a commissioned piece, my client had to approve the sketch. 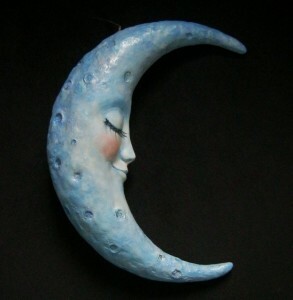 She wanted a woman in the moon with a knowing look, dainty features and real eyelashes. 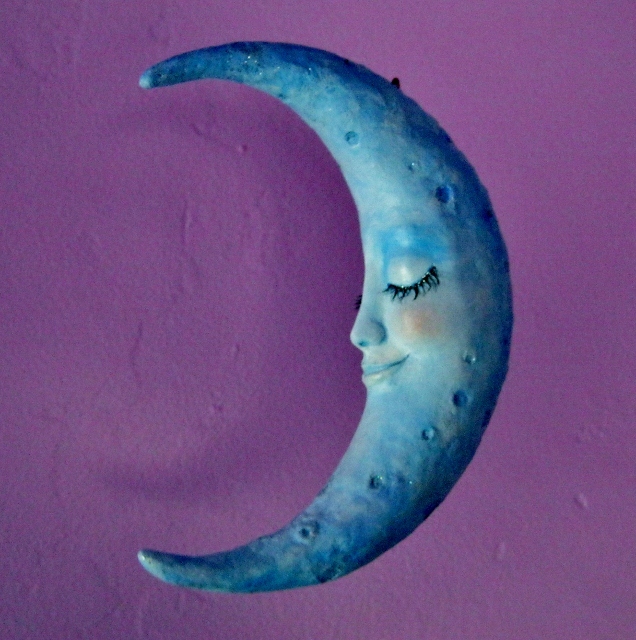 And she wanted to be able to hang it from the ceiling. 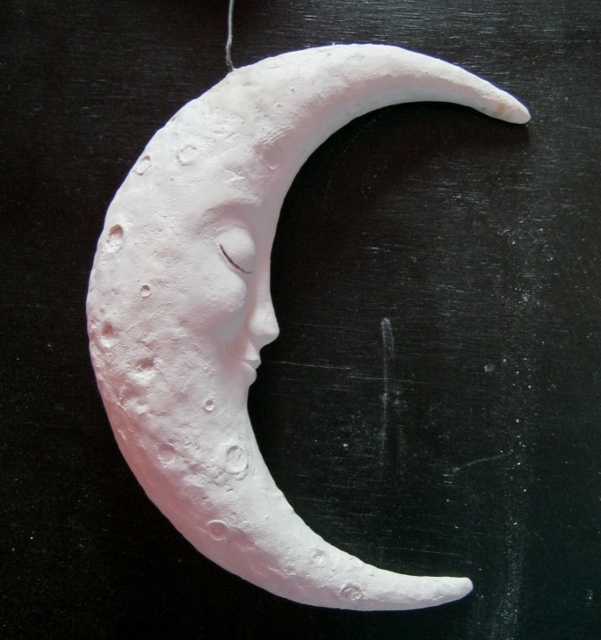 The dimensions for the sculpture are 9″ in diameter and 2″ in width. 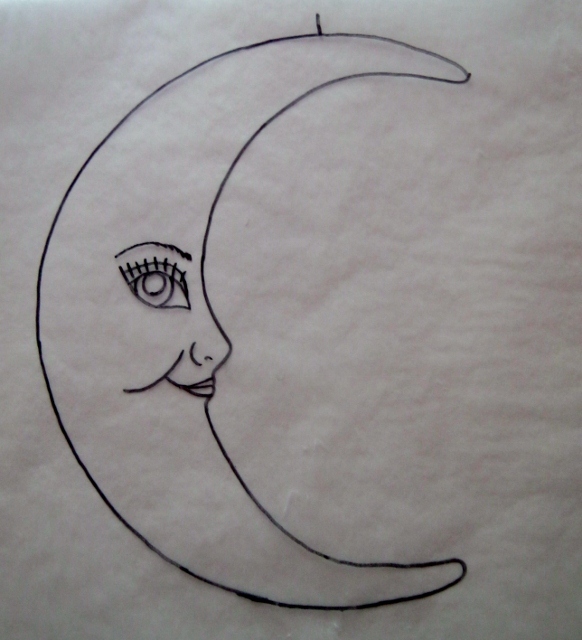 I actually took a 9″ paper plate to trace the outline for this full size drawing. I wanted to keep the original sketch intact so I traced it onto heavy paper, cut it out, then made another smaller piece to use as a template for cutting cardboard in the next step. 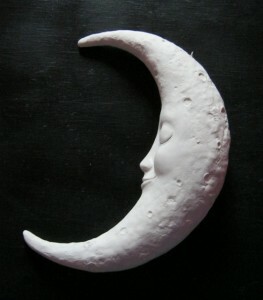 Every sculpture needs a foundation to make it sturdy and to use less clay. 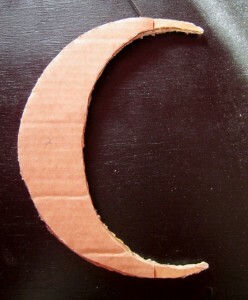 For a piece of this size I like to use corrugated cardboard from old shipping boxes. 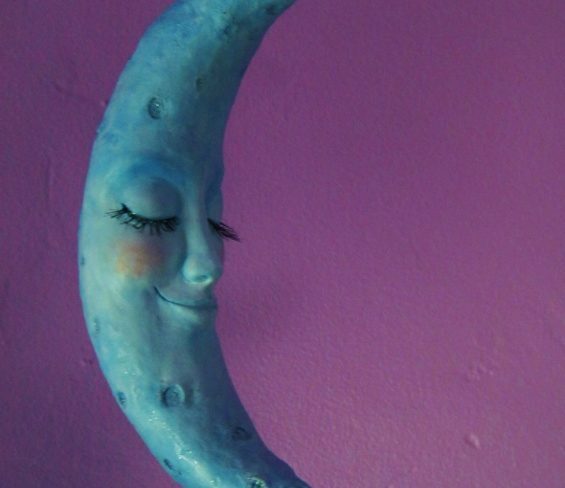 You most likely have a few lying around if you happen to do any online shopping. 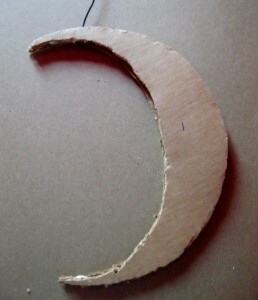 The thickness of the cardboard makes the shape bulk up faster. 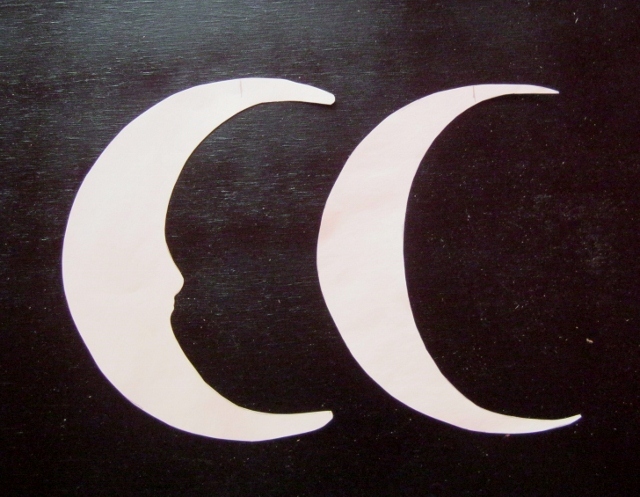 I cut out six pairs of moon shapes but only ended up using five. Each layer was a little smaller than the last. 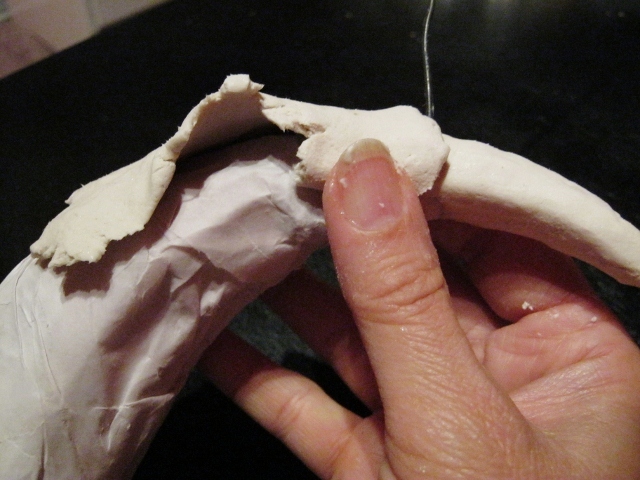 The layers get glued together. 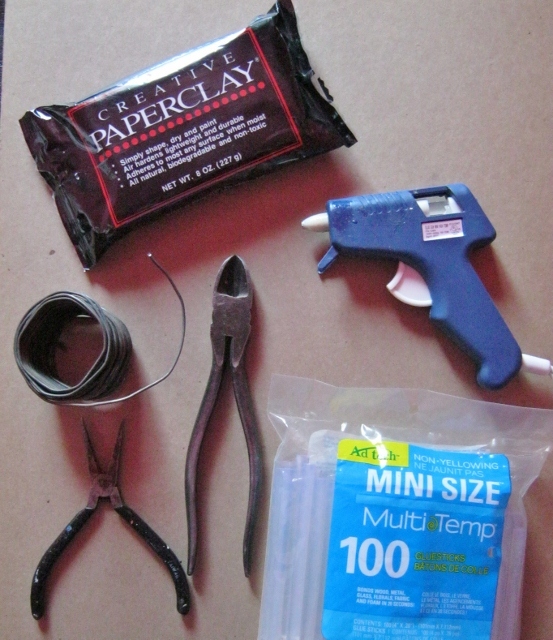 I use tie wire a lot in my artwork because it’s strong but not too hard to bend. 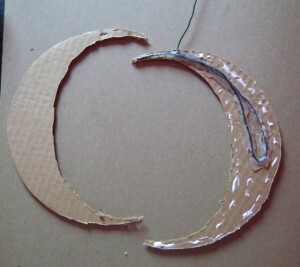 Here it’s being used to make a hanger that the moon will be suspended from. 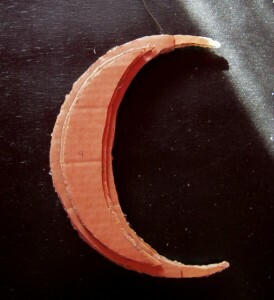 I wanted to embed it into the center to make sure it would stay in there forever and not get pulled out. 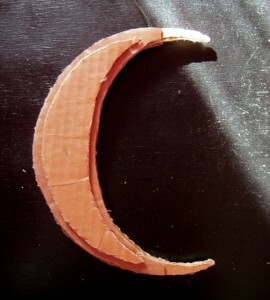 I also wanted to reinforce the crescent tip. 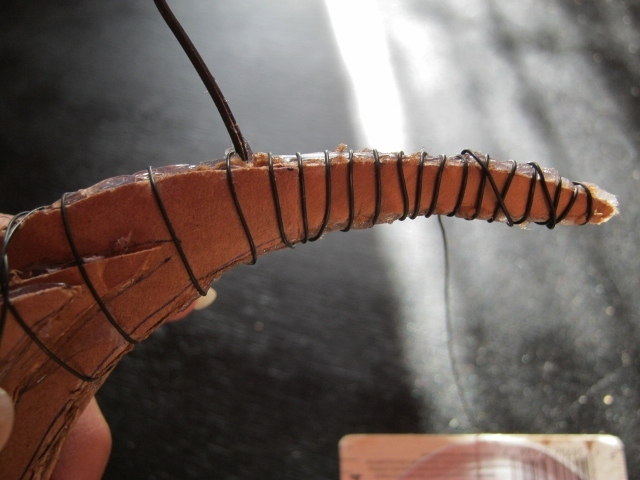 Then I cut a piece of 22 gauge wire to bind the tie wire at a certain point, shown in the next step. 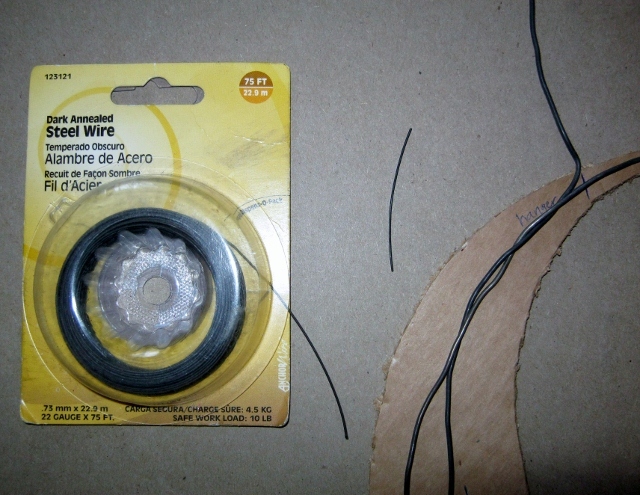 I used this 22 gauge wire to bind the tie wire together at the point where it would project out. The tie wire started at the crescent tip, went down toward the middle, then came back up near the top. 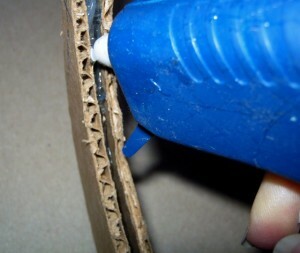 The wire was glued down well with hot glue, then more was applied around the edges along with tacky glue. I feel this combination makes a better bond. 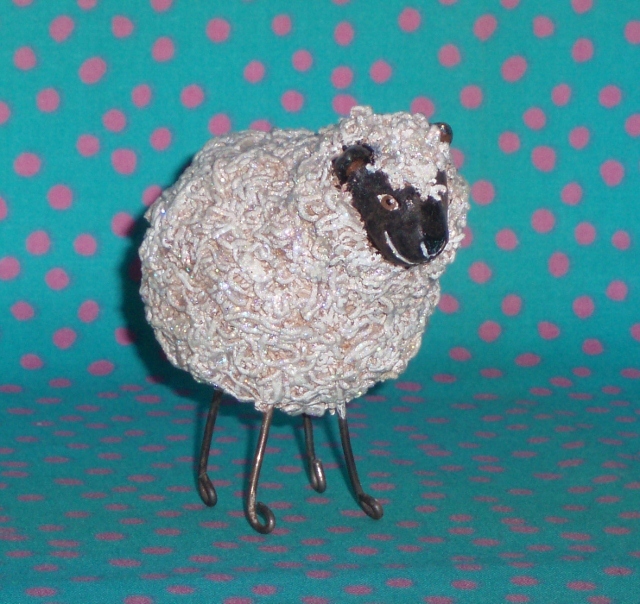 Dark annealed 24 gauge wire is strong but bends easily around shapes. 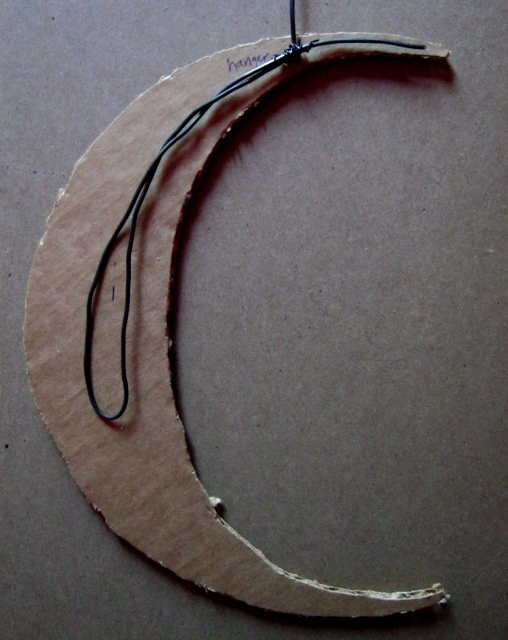 I wanted to reinforce the ends with wire because they were going to be so thin. I wrapped in one direction, from left to right, then back the other way. 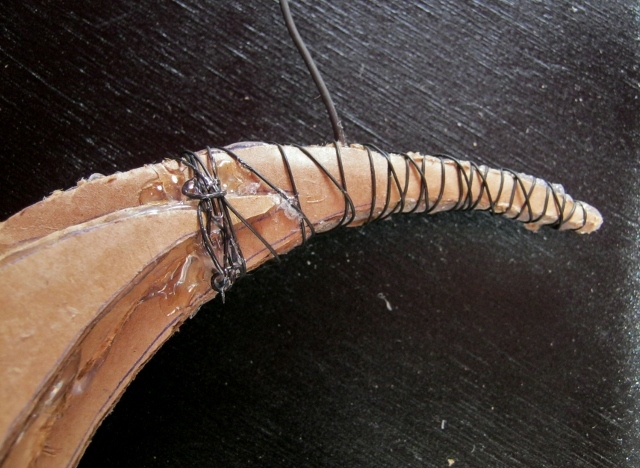 To finish wrapping, the ends of the wire were twisted under in little loops then secured with hot glue. 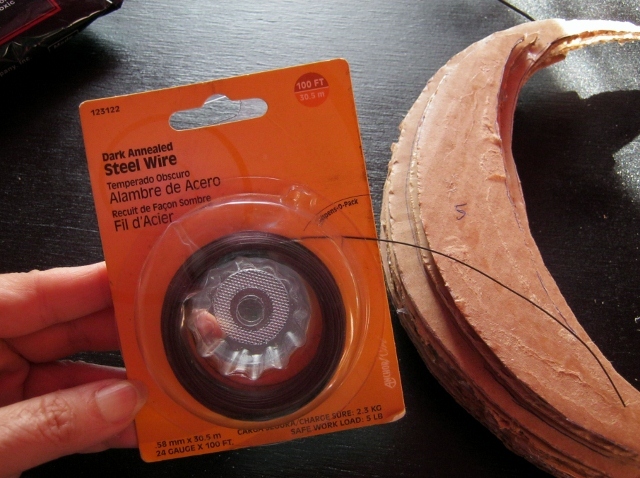 Comparing the wire wrapped cardboard form with the paper pattern. So far so good. 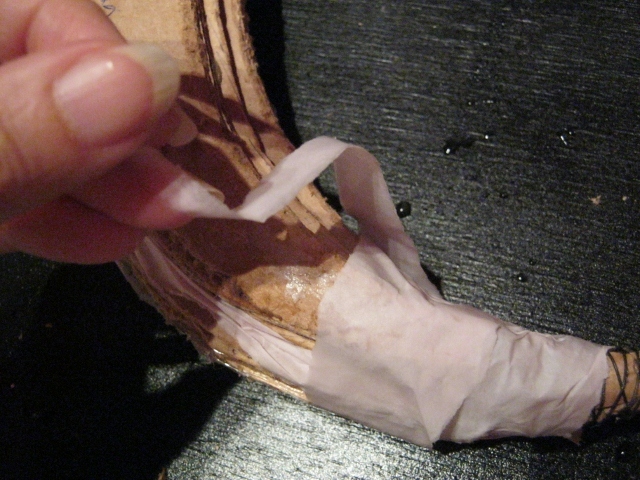 Strips of wet paper were wrapped around the cardboard and secured with a little tacky glue. 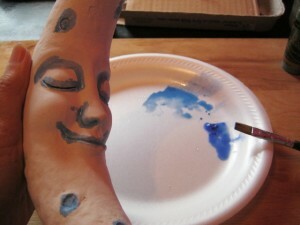 I wanted to cover the crevices to be able to use less clay. 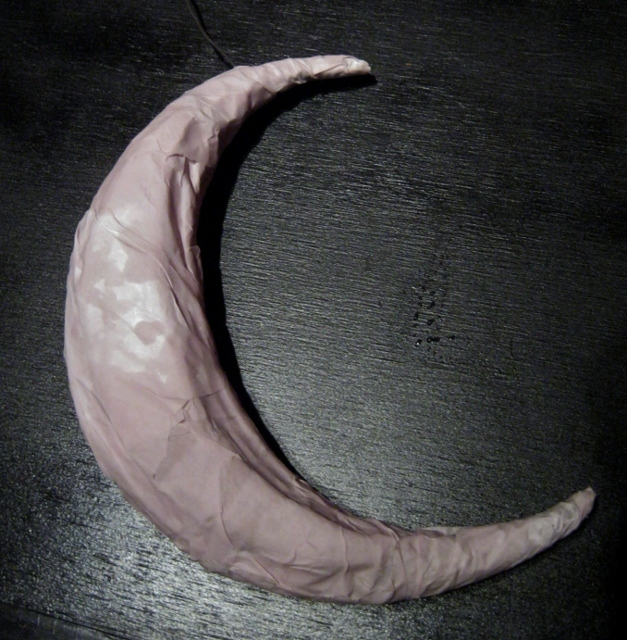 After wrapping with paper, I let this dry for a little bit before covering with clay. 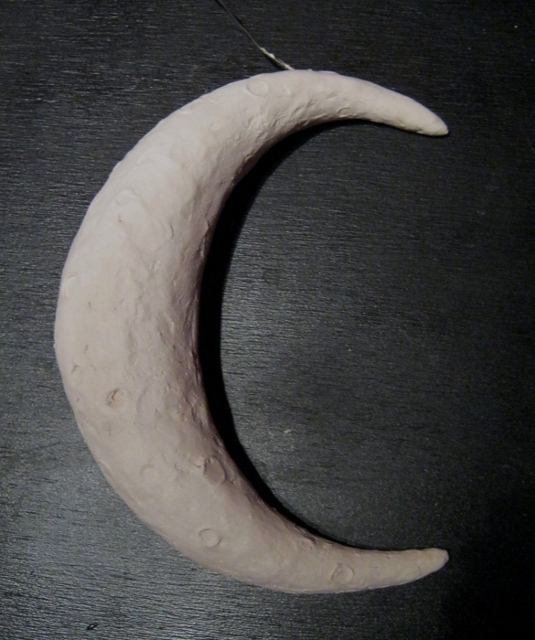 Here I’m using sheets of clay that were pressed out with my fingers to achieve a somewhat lumpy texture for the moon. 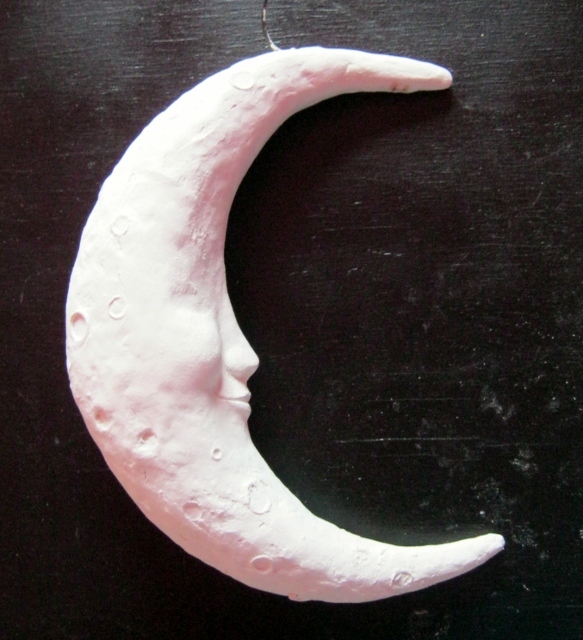 Paper clay can be carved wet or dry. Here I’m using my knife to thin this section. I let this harden overnight. 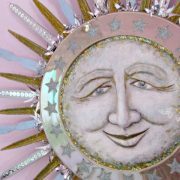 If you’re in a hurry, you can speed up the drying process by placing the piece in a 200 degree oven for a couple of hours. The second layer has a lot of bumps and craters scattered about. 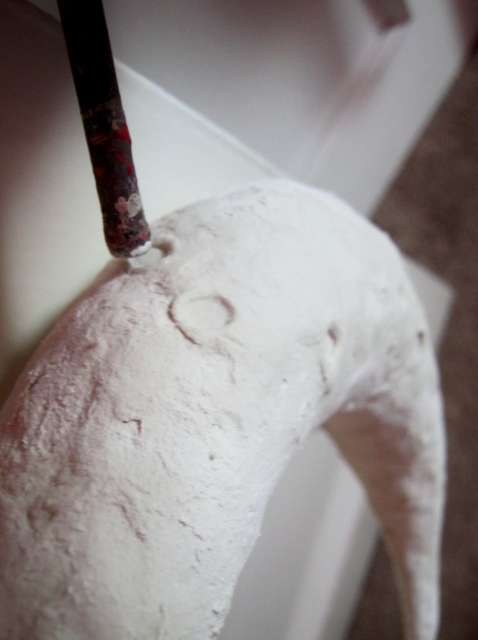 I used different sized dowels to make the craters while the clay was fresh. The one in this photo is a 1/4″ dowel. 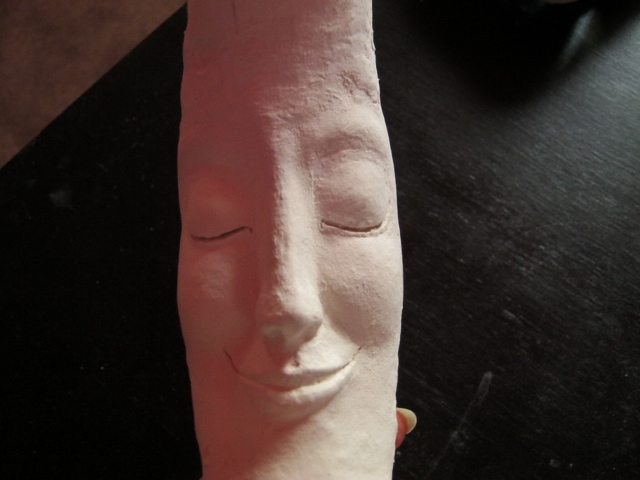 I added a rectangular blob for the nose and blended it onto the dried clay. 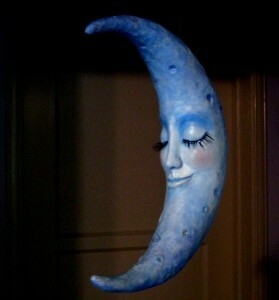 You can see the wet part is darker than the rest of the moon. 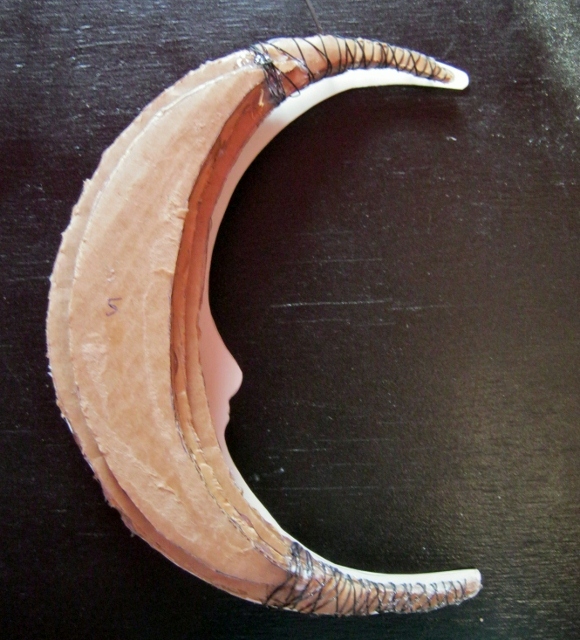 I shaped it with my fingers until it matched the shape of the nose on the paper pattern. 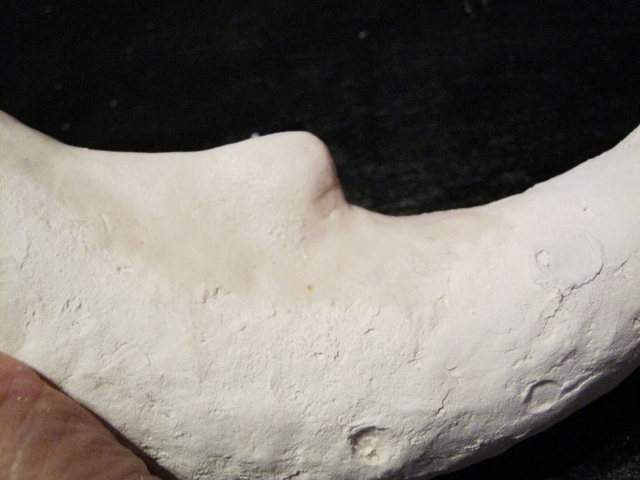 Then I used a small rounded dowel to define the sides of the nose and make nostril impressions. 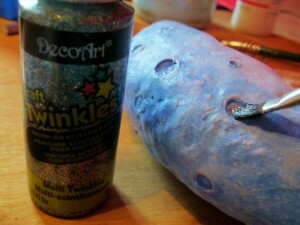 The end of a small paintbrush would also work. 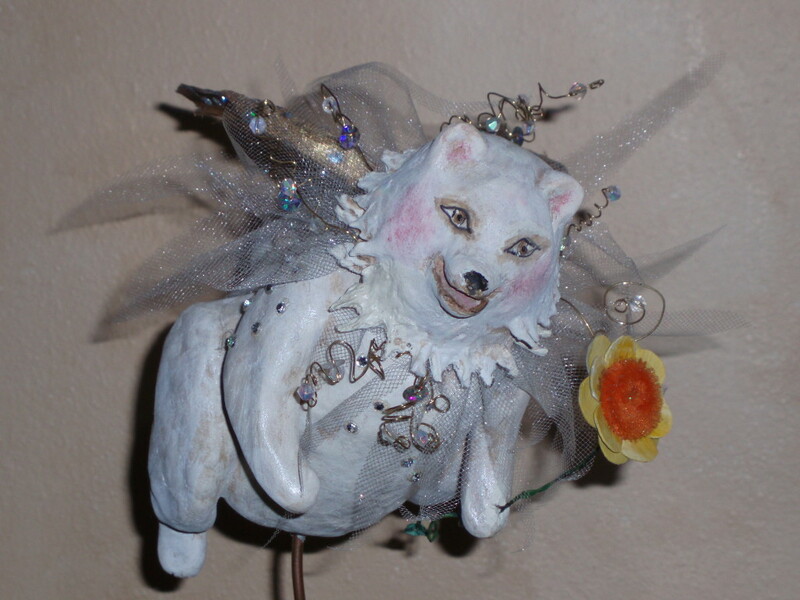 I did one feature at a time and let it dry to avoid messing up what I had just finished. 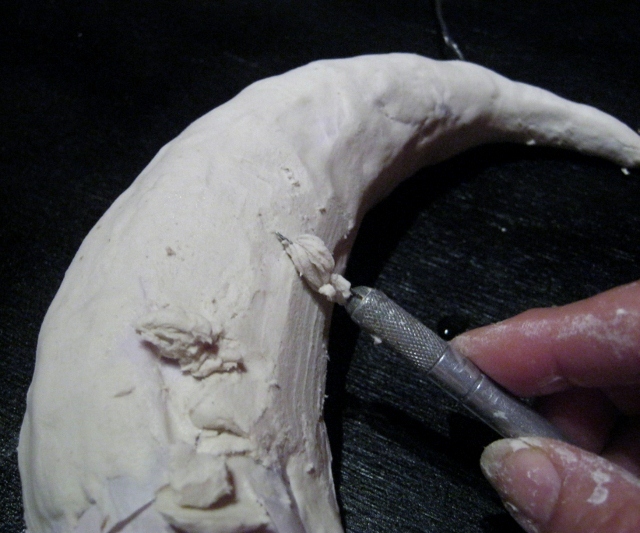 To make the mouth I rolled out a small clay snake the length of the mouth. I used my knife to shape and blend it in. 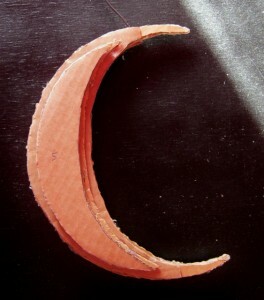 Then I used the knife to separate the shape into two lips. 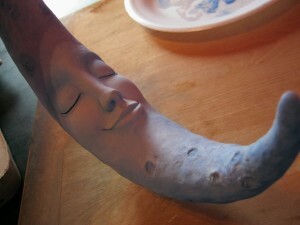 In this photo you can see more of the details in the nose and mouth. 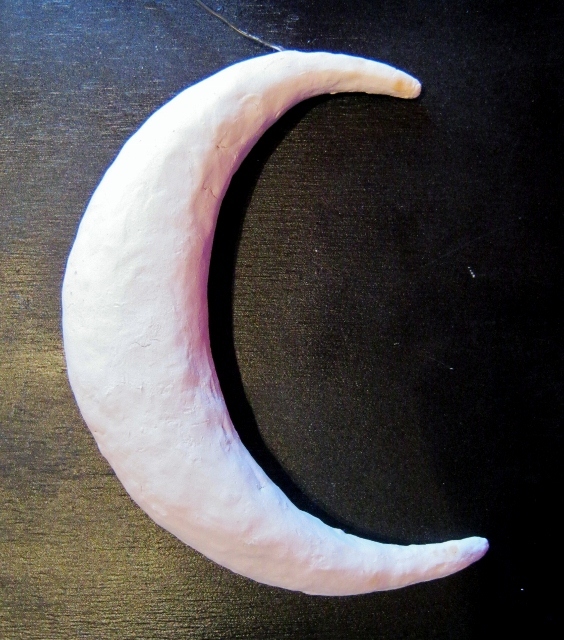 To make the cheeks I rolled a small ball of clay, flattened it out a little and blended it in. It took a bit of time to make sure both sides were even. 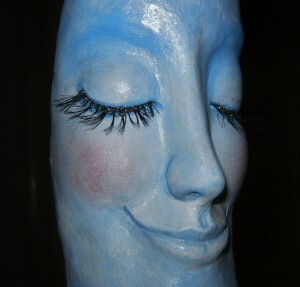 Just before I did the eyes, my client decided she wanted them closed. 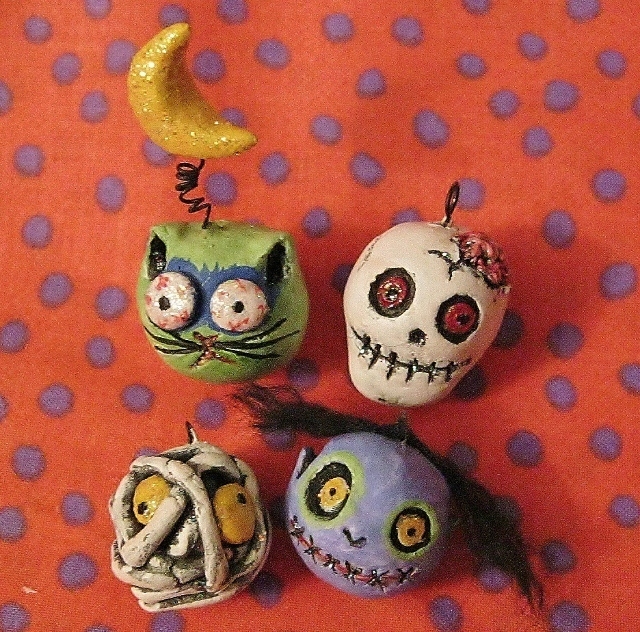 I used a small ball of clay for the eyes. I added a snake above them for the eyebrows. I blended everything in and made the eyelid crease by pressing in with my fingers. 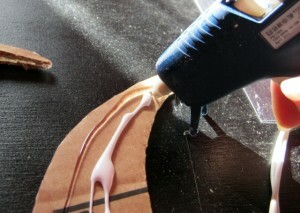 Then I cut a groove into the lid for the eyelashes to be added afterwards. 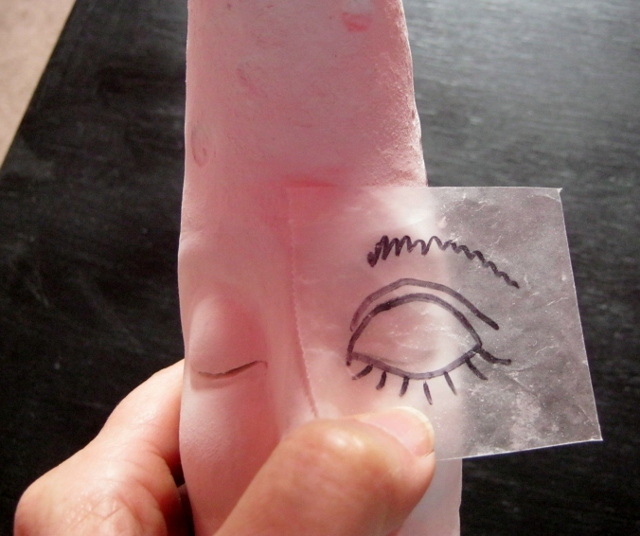 I drew this template on wax paper and used it as a guide to make sure the eyes were the same on both sides. 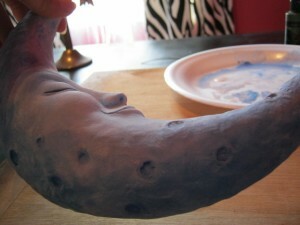 Here is the moon with all the major sculpting completed. 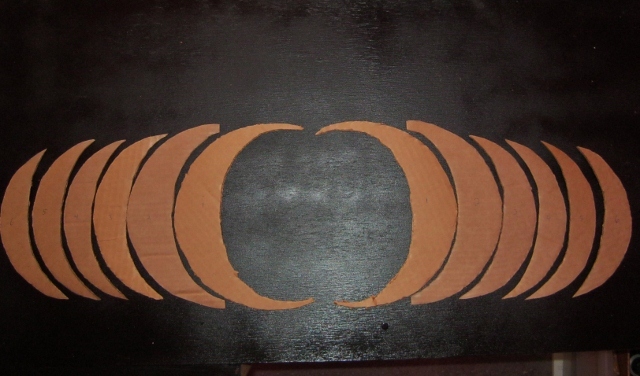 After this picture was taken, I used my X-acto knife to refine the features and fine sandpaper to smooth the surface. 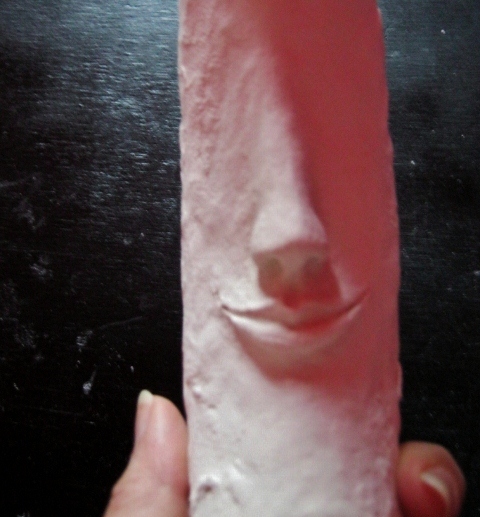 The texture goes from smooth in the center to increasingly craggy the further it gets from the face. 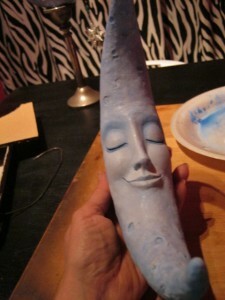 Clay can be reused even after it’s dried. Put discarded chunks back in the container/bag along with a little water. 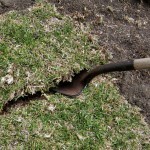 It will soften up again. 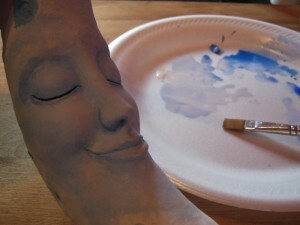 Painting and finishing touches for the moon sculpture. 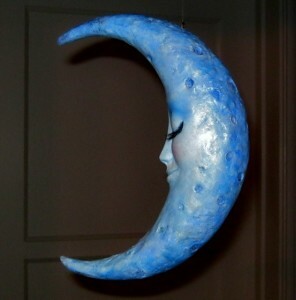 Colors used: true blue, cobalt blue and white. 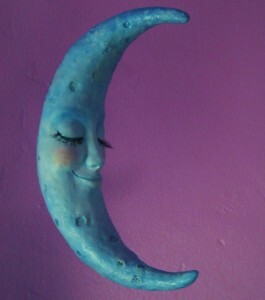 The cheeks were dry brushed with pink paint. 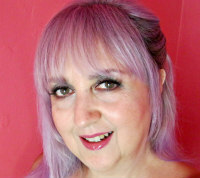 Human hair eyelashes (Ardell 122) were applied with tacky glue, then lined with the same glitter gel. 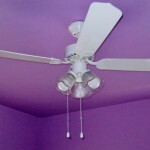 Three coats of watered down satin varnish were used to seal the paint and enrich the color. 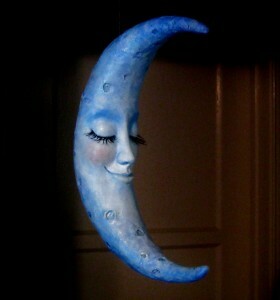 Notice the moonly glow from the silver paint. Project completed. 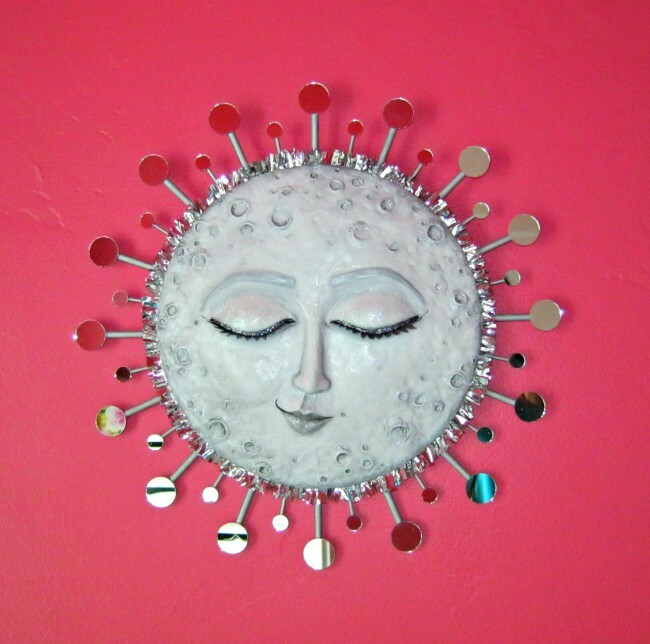 Meet the Muse in the Moon! 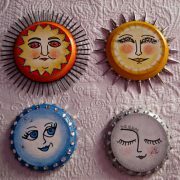 Want me to make something special for you? You can get in touch with me through the Contact button at the top of the page. 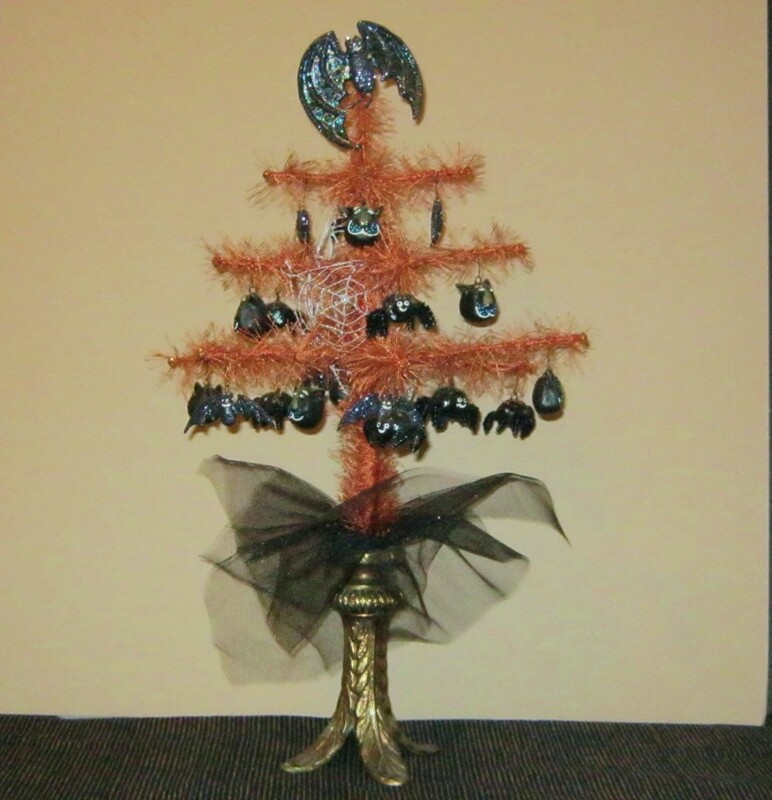 Creepy crawly bats, cats and spiders tree made with tie wire, yarn and paper clay ornaments. Sold to a collector. 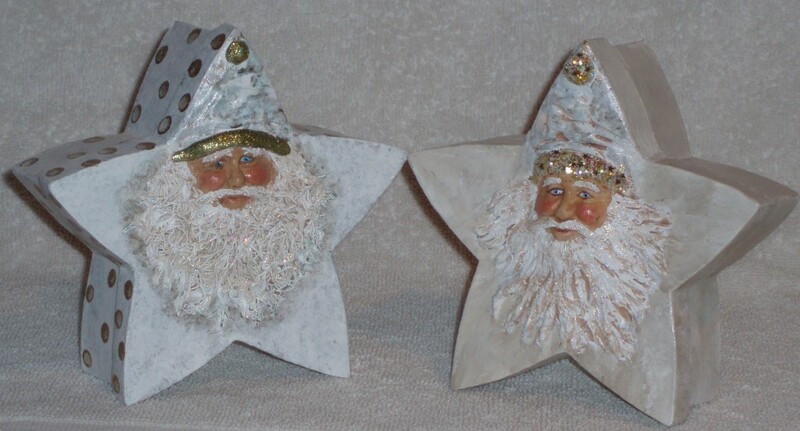 Star santa boxes with sculpting and faces pressed into molds. 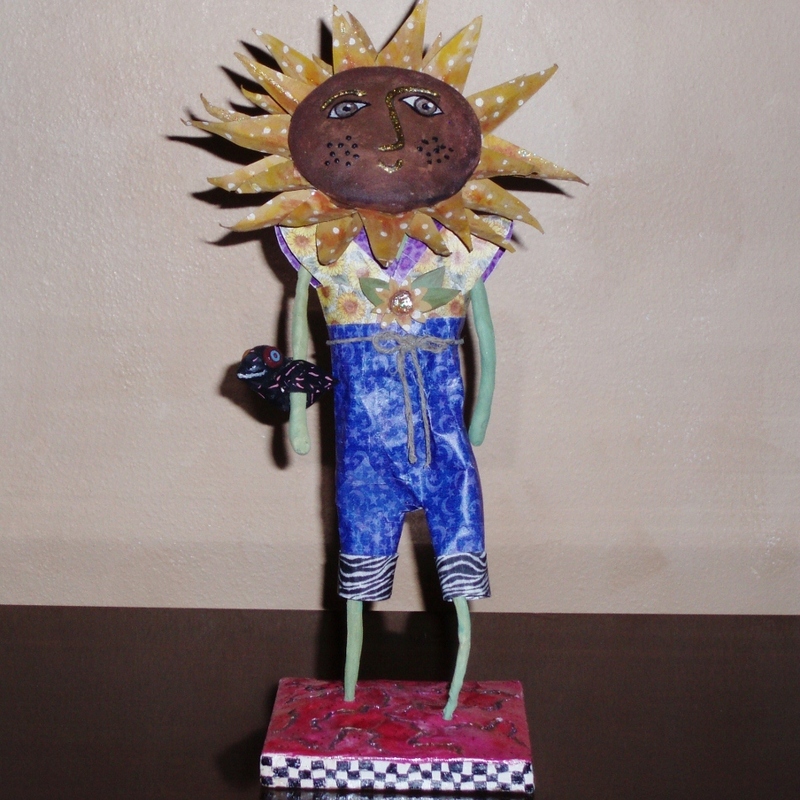 Sold to a collector.